In all the world of coffee substitutes, this one is the closest to the real thing that I’ve yet tried. Closer than acorn coffee, closer than dandelion coffee, even closer than my other favorite, chicory coffee. What is it? Coffee made from the California coffeeberry and its cousin, the Sierra coffeeberry. I mean, the name alone should tip you off, right? But many believe the common name comes from the fact that the plant itself looks like a real coffee bush, and it does. What’s more, the seeds of this plant don’t look much like actual coffee beans, so maybe they’re right. But the roasted “coffee” you make with these plants is more than worth your time and effort. First, the plants. They are now known as Frangula californica and F. rubra; there is also a F. purshiana, which I have not yet tried. All used to be in the Rhamnus genus, but are no longer, probably for genetic reasons. California coffeeberry lives in California (obviously), as well as Arizona, Nevada, Oregon and New Mexico. Sierra coffeeberry only lives in California and Nevada. F. purshiana lives in California, Oregon, Washington, British Columbia, Idaho and Montana. 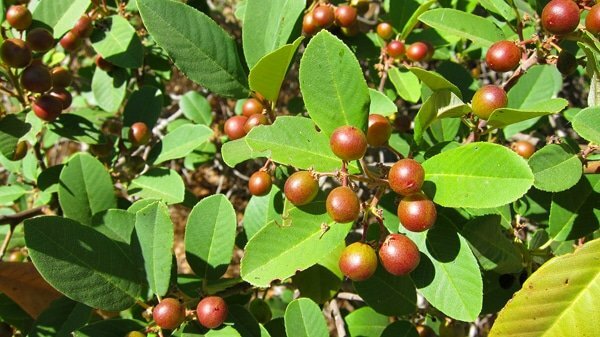 Sorry Easterners, no coffeeberries for you, although you have another plant, the Kentucky coffee tree (Gymnocladus dioicus) that is apparently similar in flavor; I’ve never tried it. Also known as buckthorns, these are all shrubs of varying height, ranging from scrubby little two-footers to great big 12-foot-tall monsters. Most stand about 7 to 8 feet in my experience. They all like chaparral and similarly dry places, or at least dryish — I know of a bunch of California coffeeberry bushes at Tomales Bay State Park, which isn’t exactly desert. I also tend to see them a lot with other berries, like currants, gooseberries, buffaloberries, salal and huckleberries. The berries ripen in late July and August here in NorCal, and I suspect a month earlier in Southern California and even earlier in Arizona. They go from green to pale yellowish to red to blackish purple. You want to collect them when they are black. 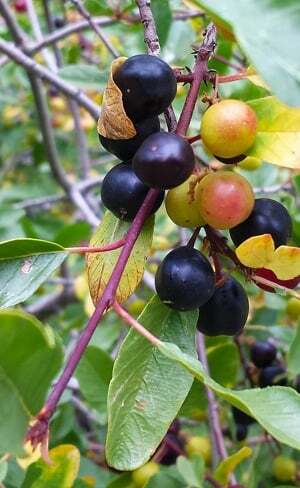 If you look at the berries of the Sierra coffeeberry up close, they look remarkably like little prune plums. Picking is easy, as they are large berries that come off the bush readily. And remember, you want the seeds, so you don’t have to be too delicate with the berries anyway. Can you eat the berries? Sure. 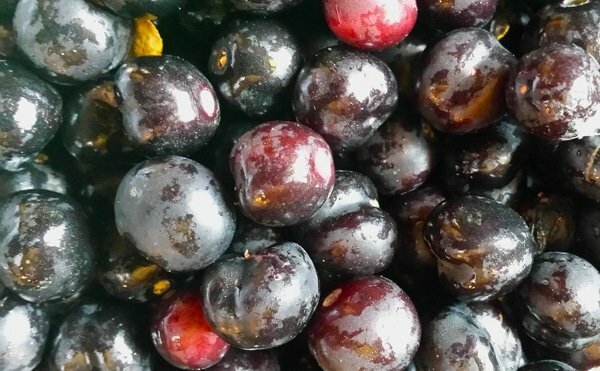 I’ve eaten a handful or two, my friend Josh has made a pie with them, and I’ve heard of others who have juiced California coffeeberries and drank whole glasses of the stuff with no ill effects. That said, there is ample evidence that the berries have at least some laxative effect — but then again most berries will give you the shits if you eat too many of them, right? I think the flavor is just OK, sweet, a little figgy, not all that interesting. But not offensive at all. Start by putting the berries in a pot. Just barely cover with water and boil for 5 minutes. This loosens the berry from the skins. 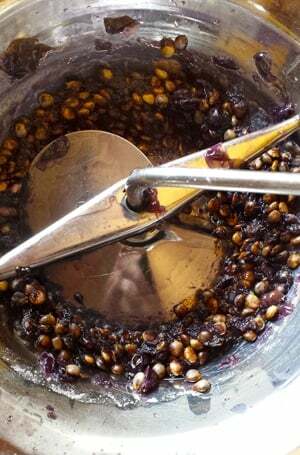 Run the cooked berries through a food mill with a medium setting: Large enough to let the pulp get through easily, small enough to block the seeds. Periodically spoon out the pulpy seeds into a bowl. Be careful as the purple pulp and juice will stain anything they touch. Compost the pulp or make jam or whatever. For this, it’s the seeds you want. Fill your seed bowl with water and gently massage the seeds under the water; this loosens any remaining pulp. Pour off the water. You can let the few seeds that float go as a sacrifice, or you can pick them out by hand. Fill the bowl again, massage the seeds again, and pour the water off. I find it usually takes me 4 to 5 changes of water to get perfectly clean seeds, which range from beige to chocolate brown. Lay the seeds out in one layer on a baking sheet and let them dry out. When they dry, the seeds will look just like green lentils. Now you’re ready to roast. Preheat the oven to 400°F. Put the baking sheet with the seeds in the oven and roast for 20 to 30 minutes, stirring from time to time. Remove the beans and let cool. Grind only when you make the coffee, as they seem to lose flavor quickly. 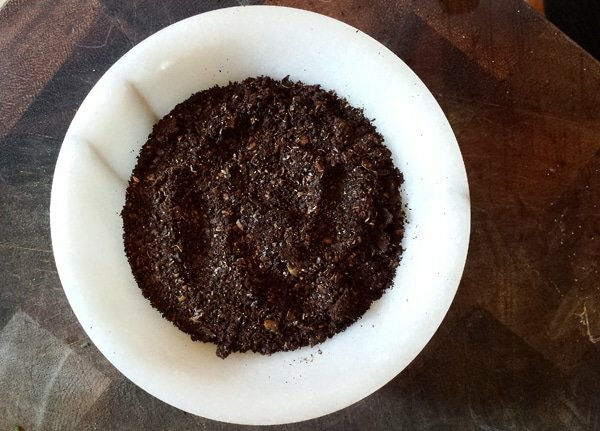 When you are ready for some coffee, grind your seeds. You will immediately smell them, and be happy: California coffee smells a lot like regular coffee, with something like a mocha overtone. Use a little more ground California coffee than you would regular coffee, but brew as normal. Straight, it’s lighter in color than regular coffee, and a tad yellower. The flavor is naturally a bit sweet (although I still add a little honey) and really does taste a lot like store-bought coffee with a chocolaty mocha thing going on. I add a touch of cream to mine. So there you have it. Coffee from a local shrub that is really, really common in many parts of the West. And yes, I know: There’s one vital question you have about this coffee. Sadly, the answer is no. So far as I can tell, California coffee has no caffeine. Alas. Can these berry plant grow in extreme weather ? Over 120F like in Southern California. Like in the Imperial or Cochella Valley climate? Leticia: Nope. But it does grow on the coast of SoCal.